The pamiloo is now sitting outside the Dundee office ready and raring to go. 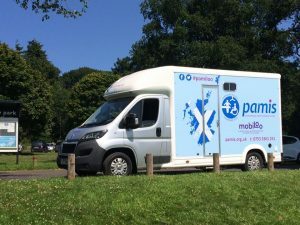 A number of PAMIS volunteer drivers have signed up to the online Mobiloo training and are practicing their skills. We will be at Balmeddie beach for Pony Axe S on Tuesday 25th July and St Andrews beach on the 28th July. We will also be at the Fife Fun Day on the 29th July. We are all so excited here at PAMIS to be finally be able to go on the road and make outdoor events fully accessible.